The Vintage V Diner Booth (Model V-4300) over the years has become our most popular booth design ever! This Model represents a fully upholstered booth of classic design and features an inserted “V” design with contrasting Piping, and as shown, is upholstered with our sparkling Zodiac vinyls. You may also choose from our selection of standard or designer vinyls. 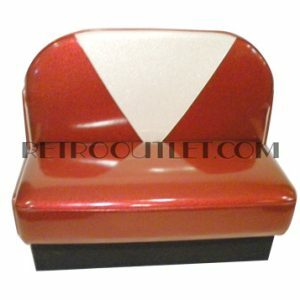 Whether you choose this design for your home, or for your new retro diner somewhere in the world, this is by far one of the most popular diner booth models ever! 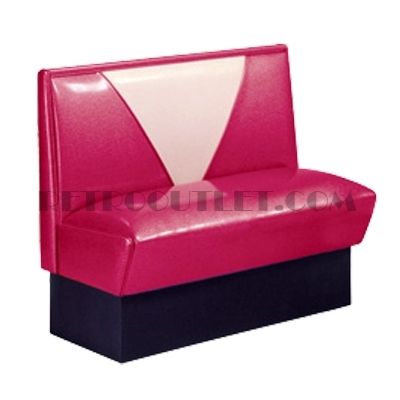 Please allow 4-5 weeks for production of the Vintage V Diner Booth in your choice of colors.